grow at the UMN Horticultural Research Center. The research center is home to a wide array of species and cultivars not found in other regional vineyards due to our cold temperatures and short growing season. 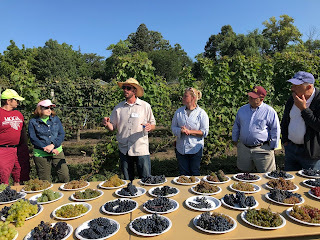 The tasting included European varieties, an assortment of table grapes, French-American hybrids, University cultivars, Elmer Swenson cultivars, as well as potential new varieties that have been elevated within the breeding program. The diversity of colors, flavors, shapes, and sizes captured the audience’s attention. A favorite on display was ‘Orange Muscat’, a variety that is not cold hardy but is grown in the HRC greenhouses to be a pollen donor in the breeding program. 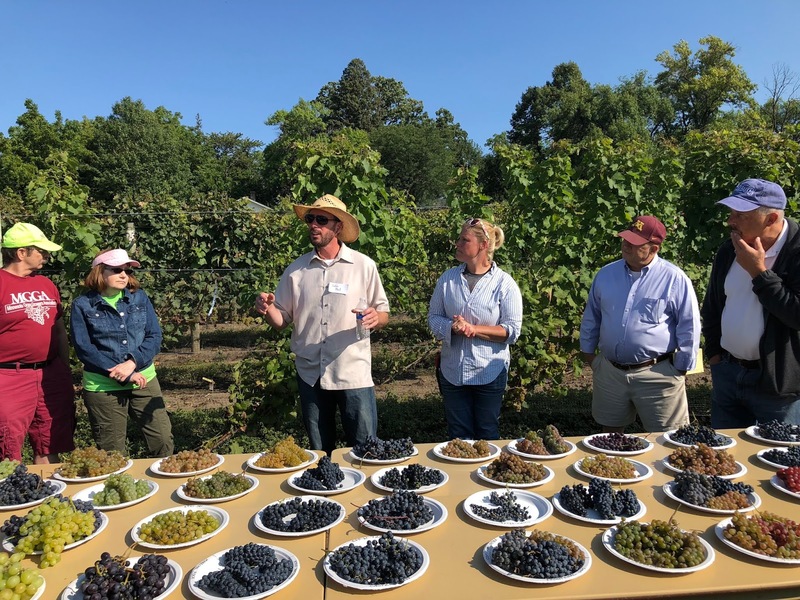 Visitors to the open house were also offered to taste three freshly pressed grape juices and to imagine what flavors and aromas might be present when they are turned into wine. The winery was also used to showcase research posters that graduate students had presented at recent conferences. Attendees learn about kiwiberry. Photo: Matthew Clark. One poster highlighted a current study to develop embryo rescue protocols for cold hardy table grapes. Also on display were the trophies from the 10th Anniversary Cold Climate Wine Competition. 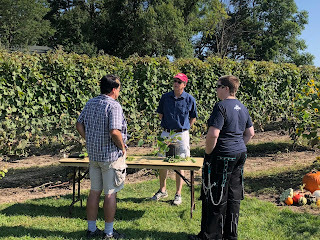 Dr. Bob Guthrie, an enthusiast and scholar of Kiwi (Actinidia spp) also presented some selections of cold-hardy kiwiberries. Guthrie has been a volunteer at the HRC, and along with fruit breeder Dr. Jim Luby has a grant to study potential new varieties adapted to Minnesota.